Camden Passage 4.5 out of 5 based on 6 ratings. 6 user reviews. Not to be confused with Camden Market, Camden Passage is London’s premier antiques village which offers a huge array of stalls and specialist shops which have given the area a worldwide reputation that attracts thousands of antique dealers and collectors alike. 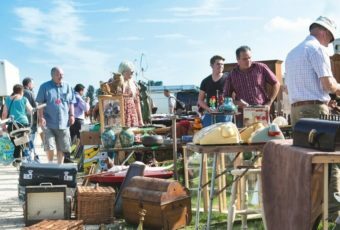 With so much on offer, a simple afternoon stroll is likely to end with an unusual gift purchases or the discovery of the vintage oddity, that is likely to become your favourite show piece. 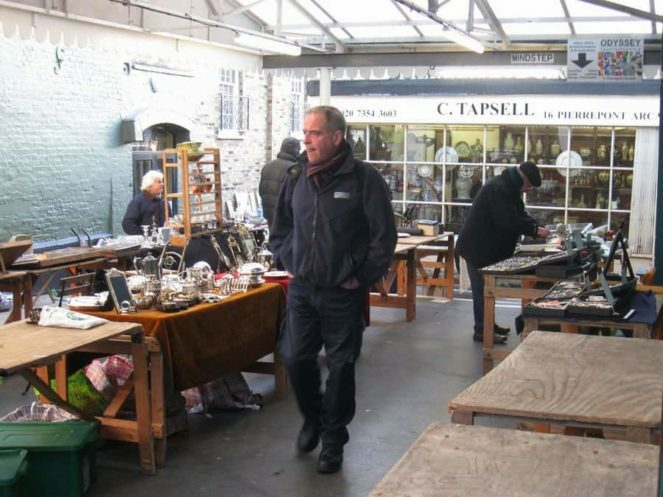 Originated in the 1960s, this quaint pedestrianized passage provides visitors with over 200 antique dealers trading in anything from Staffordshire Pottery to antique door handles. However, Camden Passage really excels with unique art deco and beautiful vintage jewellery of all kinds. Parisian accessories are here in abundance and provide the perfect accompaniment to the vintage fur hat that you can unearth here for just £10. 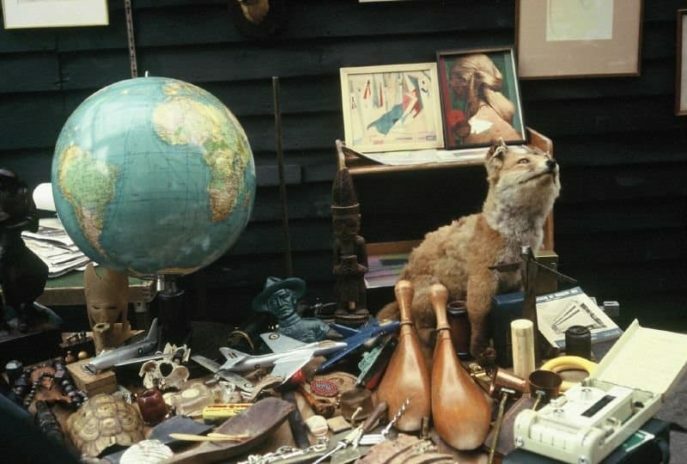 With four separate market areas that serve a different area of expertise, it is worthwhile taking your time to experience the mounds of sparkling trinkets, vintage clothing rarities and scarce first editions Camden Passage has to offer. Annie’s Antique and Vintage Market – Located behind the popular Camden Head Pub on the entrance to Camden Passage, Annie’s Antique and Vintage Market offers a wide selection of collectibles and interesting items, ranging from vintage buttons, retro playing cards to the most stunning jewellery in town. 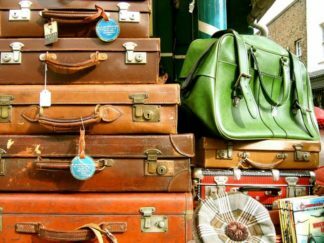 Camden Passage Market – Located in the heart of the passage, offering an eclectic mix of vintage clothing alongside retro luggage, one off items and precious (!) 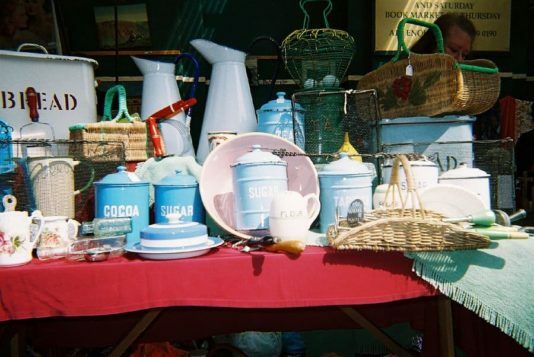 bric-a-brac. 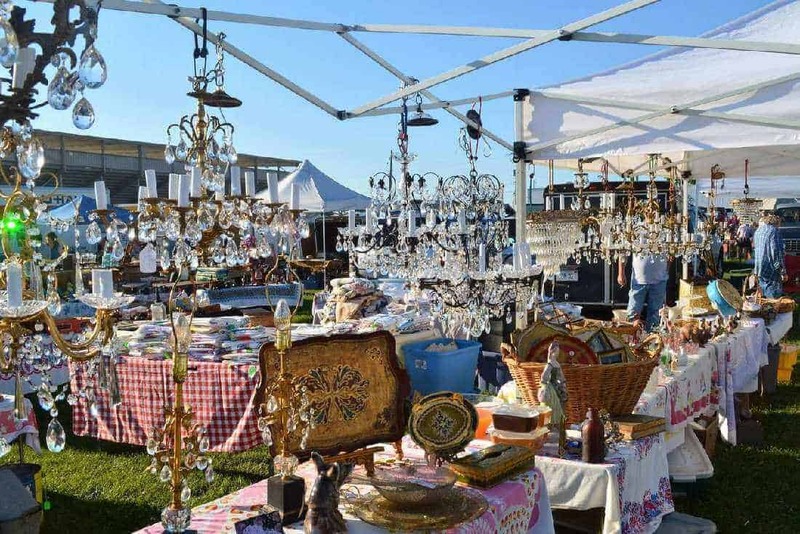 Charlton Place Market – Your one stop shop for rare antiques and collectibles that is open on every Wednesday and Saturday. Make sure to visit, even it’s just for home decor inspiration. 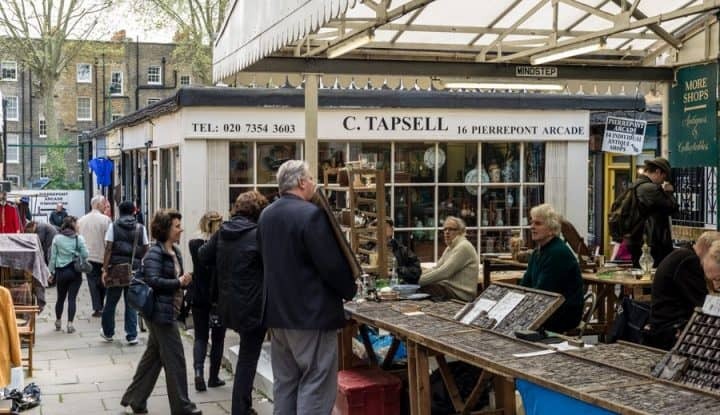 Pierrepont Arcade Market – The covered market area towards the far end of Camden Passage is open all week with a specialist book market on Thursday and Fridays and an excellent place to find antique gifts and designer costume jewellery. 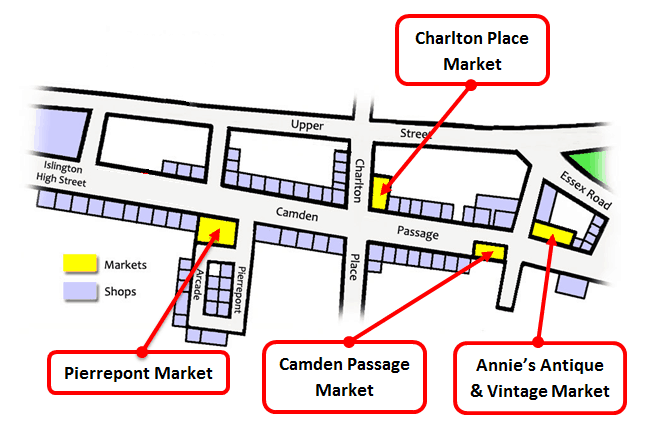 Official market days at Camden Passage are Wednesday and Saturday. 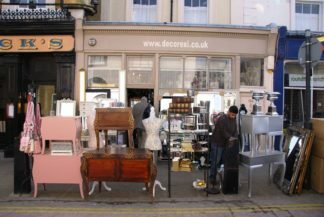 However, if you happen to stumble into the area at any other time, many of the boutiques and stalls will still be open and are likely to offer you a great deal. The location of Camden Passage is key to its success, with numerous cafes, restaurants and bars located on the busy Upper Street and popular surrounding areas. A visitors favourite is the Austrian ‘Cafe Kipferl’, with its traditional coffee blends and homemade, mouthwatering apple pie. For everyone who has tried their ‘Schnitzel’, it is no surprise this Viennese delight is growing from strength to strength. No trip to the Passage is complete without a visit to ‘Paul A Young Chocolatiers’. Specialising in developing new and original flavour combinations, this multi-award winning store offers the perfect romantic gift for someone who deserves it or something to take home and enjoy yourself (don’t blame us for becoming a chocoholic!). 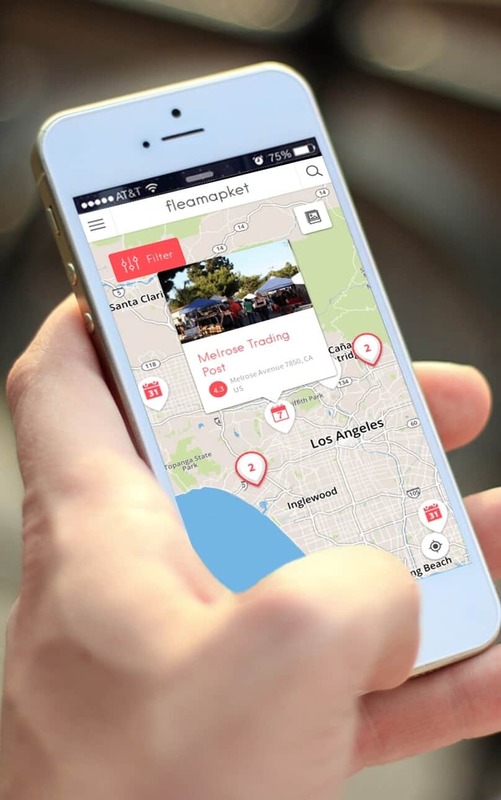 The trendy restaurants and cafes offer visitors something a little different than what most markets in the city do. 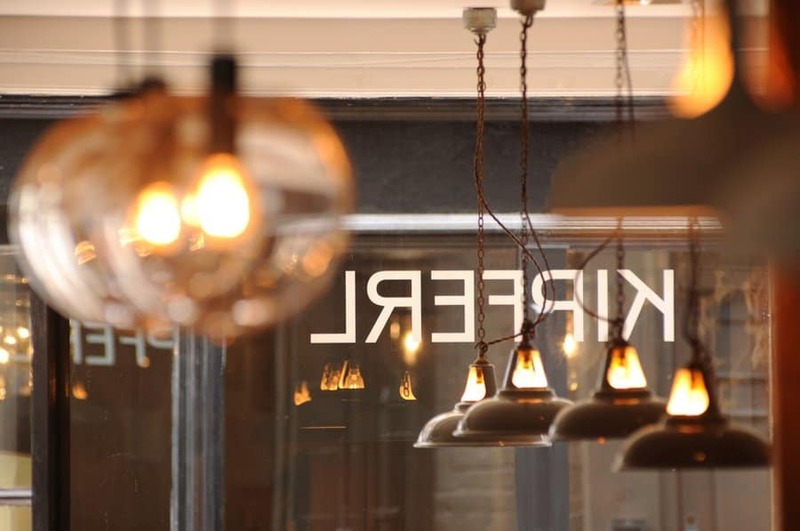 The specialist cheese shop with the cosy wine bar upstairs will fill your afternoon with a distinct European vibe, whereas a five star gourmet meal at Frederick’s Restaurant makes you see the world with the eyes of the a real gourmet. And don’t forget to visit the popular Fishmongers ‘Moxon’s’ and treat your whole family to a delicious fish supper at home. Behind the market area a part of the London canal network invites you to enjoy the peaceful environment just yards away from the hustle and bustle of the city. Soak up the tranquil surroundings and relax at a beauty spot that is a true contrast of modern city living. 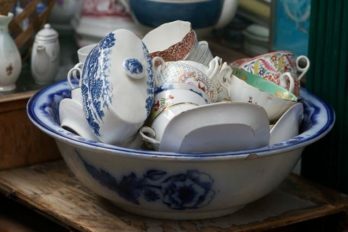 Like most antique markets, Camden Passage will serve up a whole host of fine China, silverware from the Victorian and Georgian era and rare artifacts of all ages and interests. What sets Camden Passage apart from the norm, is its wide range of truly independent shops which are scattered through the winding streets. With so many spaces to explore, it takes more than one visit to ensure you have discovered all the beauty it has to offer. The Vintage Clothing shops are a favourite among the local trendsetters and offer a more unusual selection at more competitive prices than the likes to be found in Brick Lane & Co. Camden Passage is also a magical find for knitters and crocheters, with the Loop store rated as one of the finest in the world for unique pattern designs and the highest quality yarn. Worth a visit is also the shop, that specializes in selling hand crafted wooden boxes – a perfect gift for the person that has everything. 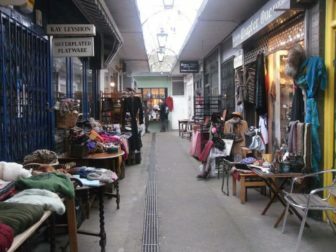 Camden Passage may be small in comparison to its local rivals Camden Town Market and Portobello Road, which should by no means deter you from visiting. 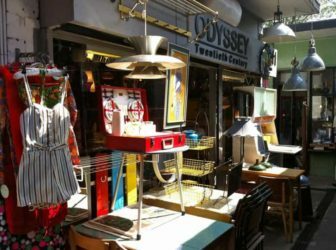 The niche shops and knowledgeable vendors add a unique vintage charm to this special market, that offers a warm and welcoming atmosphere all year round. 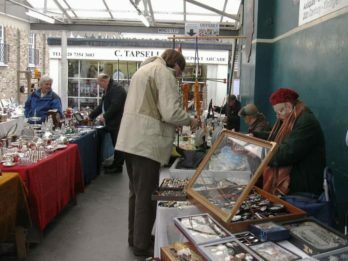 On regular market days with the majority of stalls operating, the items sold tend to be of a higher quality and can often be grabbed up for a more than competitive price. 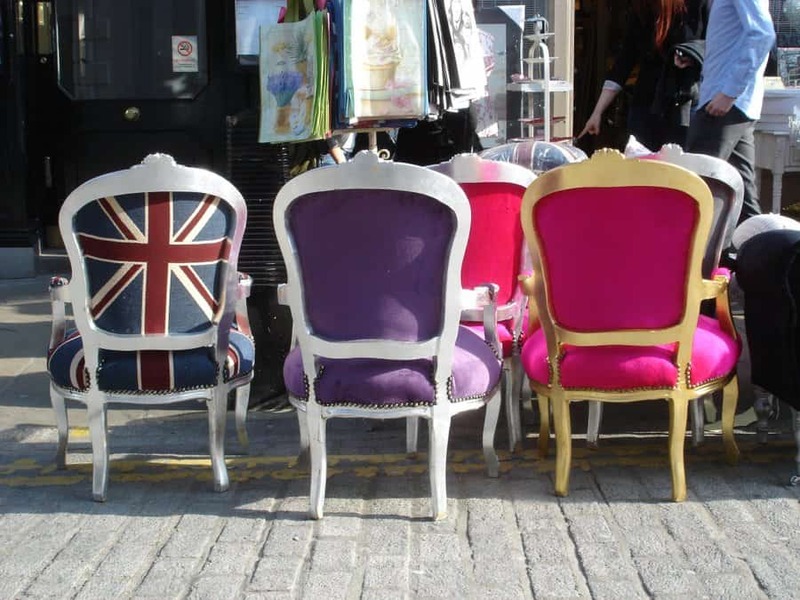 Presenting visitors with a more casual look of London, this historically important area grants a trip back in time. This is just being highlighted by the magnifique old-world items on show. World War Two memorabilia is in plentiful supply and it is even possible to discover rare coins from the Russian Revolution era. 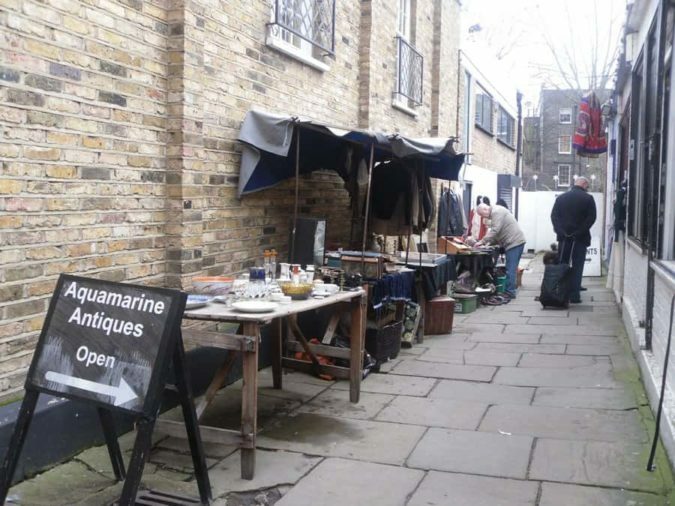 Camden Passage is a wonderful area to browse when you are not looking for anything in particular. 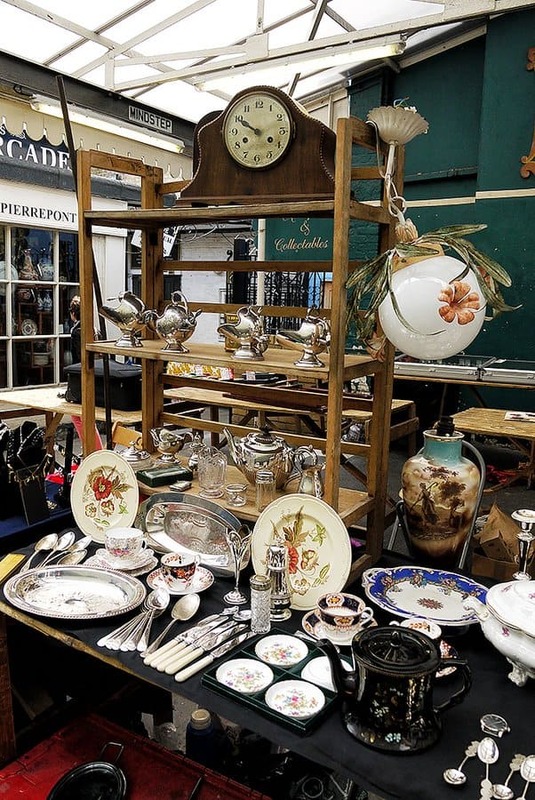 A short rummage through the stalls and you will certainly find a gem. Due to the nature of its setting, Camden Passage is frequented by all ages of people looking for a bargain or just generally enjoying a relaxing day out away from the chaos of the city. 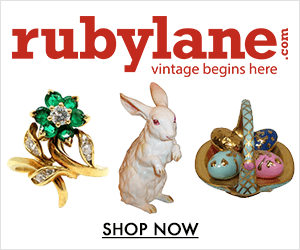 Often described as “small and personal”, the beautiful jewellery and antique shops can dazzle and amaze. Even if you come and visit from abroad, you can definitely purchase the antique oak wardrobe that you can’t take your eyes off, as most dealers provide overseas shipping. Camden Passage is definitely the place to be for a leisurely afternoon stroll and a promise of a grandiose find.